The Morris Steam Car was made in Sandringham, England from 1906 - 1912. Only one example of this mark survives and only four were made. 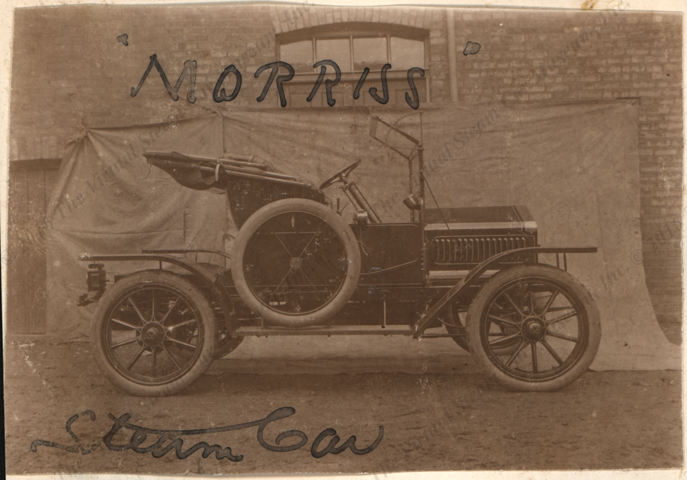 The Morris Steam Car. This image came from an English eBay dealer. There was no other information. I've drawn this information entirely from Wikipedia's List of Steam Car Makers, which cites three sources: Lord Montagu of Beaulieu & Anthony Bird, St. Martin's Press, Inc., 1971. "Appendix A". Steam Cars 1770–1970: 215–221, Appendix 3, The Complete Catalog of British Cars 1895-1975, David Culshaw and Peter Horrobin, Veloce Publishing Ltd, 1998, and PreWarCar.com. Contact us if you have additional information about the Morris Steam Car, or if you have questions.